Modern medicine has got the opportunity to treat many diseases that were considered incurable and even fatal. This opportunity came from the doctors through accurate diagnostic methods, allowing to identify the disease at its beginning. A leading place among the high-precision diagnostic methods is MRI and MSCT. Both methods, as completely different way of getting information, allow you to create a detailed three-dimensional picture of the internal organs and systems. 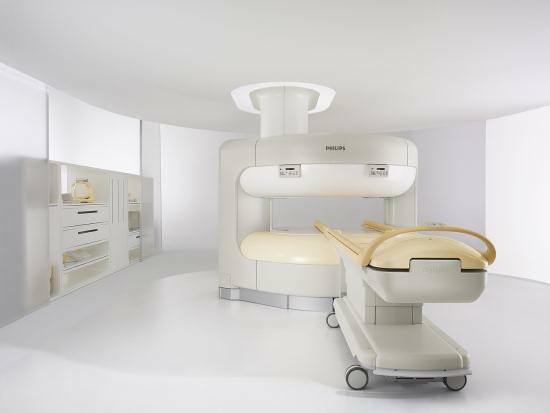 MRI and CT are rapidly evolving and currently it is difficult to prefer one of the methods, but it is an undeniable advantage, as in the presence of contraindications to one study, you can always use the second. CT refers to x-ray methods of examination. The x-ray beam around the body in a spiral, creates consistent snapshots cross-sectional images of organs and systems, hence the name «spiral computed tomography». Same as magnetic resonance imaging, CT scans, creates intervals of a few millimeters. 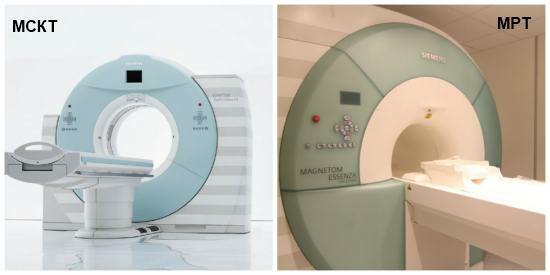 A CT scanner looks similar to the magnetic resonance apparatus, it is also has a diagnostic table, which is the patient during the procedure. The table is inside a vertical annular installation (gantry). On the inner surface of the ring located x-ray tube emitting x-rays, and sensors that detect the result of tissues, passing it on a computer analyzer. Modern units have several ray tubes, allowing to carry out research faster and better, such devices have been called multislice computed tomography (MSCT). In the early development of instrumental methods of diagnosis there was a strict differentiation between the indications for each of the methods. SKT, as the radiological method used to diagnose bone structures, magnetic resonance imaging was designed to detect pathology of the soft tissues. Currently, both methods are developing rapidly, have achieved success in the diagnosis of any of the structures of the body, magnetic resonance imaging visualizes good bone and CT allows to detect pathology of the internal organs at an early stage. MRI and CT are used to detect various pathologies: inflammation, degenerative changes, malignant tumours, malformations and trauma. Of particular importance are methods for the diagnosis of cancer, enabling identification of the tumor a few millimeters in size. Also both types of imaging allow us to identify the stage of the cancer process: prevalence on surrounding tissues and organs, metastases to lymph nodes. The only system for which there is a difference in choice of method, is the Central nervous system (the brain and spinal cord). Accurate visualization of pathological formations of the brain are available only to the magnetic scanner, but many diseases are visible with CT. Fixed metal construction inside and outside of the human body. Metal can heat up and shift under the influence of electromagnetic fields, damaging surrounding tissue and losing their function. Modern implants are typically made of inert metals which do not cause harm to the body, but can distort the result of the study, if studied side by side with the body. Severe claustrophobia. 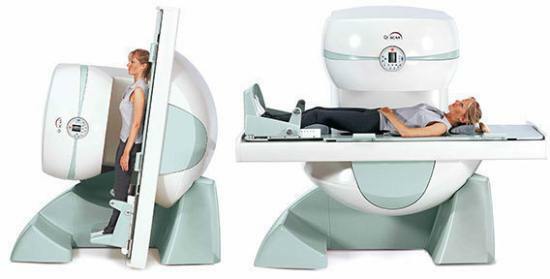 Capsule MRI differs from CT and the ring is a closed space in which you need to be motionless during the entire study, sometimes it is forty minutes. Therefore, for patients with claustrophobia will be an alternative to MSCT. Tattoo. To perform permanent pictures on the skin use a paint containing a suspension of fine metals, which also are contraindicated for MRI, even if the tattoo is made using inert metals. Electronic implants (pacemaker, prosthesis, inner ear) can fail to work under the influence of the electromagnetic field, creating a threat to the life of the patient. Weight. Capsule MRI has a limited volume which can’t fit the obese patient weighing over 130 kg. In this case, the patient can be examined using MSCT gantry which is also not infinite in size, but allows to accommodate patients up to 170 kg. If we are talking about brain examination, or the patient is unable to perform SCT for other reasons, it is possible to use a magnetic resonance tomograph with an open capsule. Absolute contraindication for SCT is pregnancy and breast-feeding. Limited application of research in young children and are not recommended repeat tests during the year. For better visualization, while CT and MRI used contrast. For both methods the most common method of injection of contrast is injected intravenously. 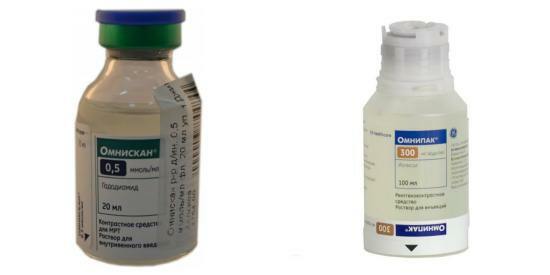 The difference lies in the active substances used in contrast agents. MRI is used for rare earth element – gadolinium. SKT uses contrasts on the basis of iodine. An allergic reaction to the contrast may cause contraindications to the study. Recorded more often allergic to iodine. Also iodine is contraindicated in violation of the thyroid gland, which may also be the reason for the preference of the magnetic scanner. It is difficult to give a precise recommendation when to use one or the other method. Select the preferred method for diagnosing needs treating doctor, including contraindications and objectives of the study. MRI differs from CT (computed tomography)?